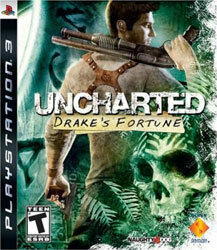 In what was a quiet year for me, my ambivalence towards Uncharted 3 was one of the few things that got me on my soapbox. In that case, its inclusion in this list is either, like Gears 3, emblematic of the strength of the series, or possibly an indication that, outside of an obscenely packed tail end, the year wasn’t all that great for gaming. While there’s some truth in both answers, and I stand by my assertion that it’s an overrated game, there was enough to enjoy in Uncharted 3 to say that it’s mostly the former. 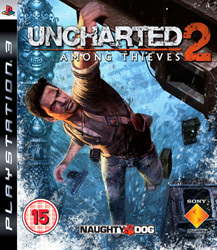 The fact that I found it disappointing is less a criticism of this game and more unmitigated praise for Uncharted 2, which still is peerless as a piece of cinematic action; if this had topped it, it would have been far more surprising. 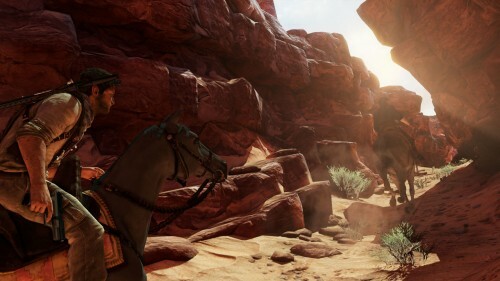 My complaints aside, it was just as much of an achievement for in-game characterisation and blending gameplay and cinema – even if the ratios were occasionally somewhat off, you had to admire it technically during sequences like the plane crash and its seamless transition to the similarly brave desert sequence – as it was a great action game… when it worked. It didn’t quite reach the astronomical highs of either of its predecessors, but it’s still fresh enough and done with such panache that it makes the lack of creativity in most action games all the more obvious. What Uncharted 3 has left me with more than anything is anticipation for Naughty Dog’s recently announced new project, The Last of Us. I never much cared for ND’s games until this series, but talk of resources being diverted from Uncharted to the new game has me very, very excited. Naughty Dog moved the goalposts, showing how to make a game cinematic without trying to be a film. People who think that Metal Gear Solid 4 did that need to take a long look at this, because Uncharted 2 tells a story and renders some truly epic action scenes while letting you, you know, play them. Take something like the train sequence, the helicopter attack in Nepal, the tank attack, the Pursuit Force-style truck chase – you get the idea – and it would fit in as a finale or banner set piece in any other game, but Uncharted 2 has almost one per level, and it still finds time to slow things down for the walk through a Tibetan village or fairly straightforward puzzle sequence. Lessons had clearly been learnt from the original’s shortcomings because this one neatly sidesteps most of them. The tightened-up shooting and lack of zombies is enough to more or less wipe out my complaints. Uncharted 2 was absolutely incredible and a huge step beyond what any other company did this year. 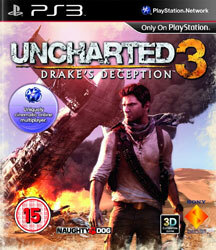 Bow down to Naughty Dog, because the ball’s firmly back in everyone else’s court. Good luck with that. Uncharted 2 does a lot of impressive things, but what gets me more than anything is quite how old it makes something as beautiful as the original game. If you have both I encourage you to compare, say, the first game’s forest sequences to the sequel’s Borneo rainforest, and then bear in mind that this is just a short sequence, and within a few hours you’ll hit the mountains of Tibet, Istanbul, Kathmandu… and some that it would spoil it to tell about. Even in that short sequence it wipes the floor with the first game, let alone the competition, and still manages far more variety in its environments. In short, I’ll be very surprised if we see many – or any, in fact – console games this generation that look better than this. The gloriously animated and acted cut-scenes are up to the standard of Heavenly Sword, and unlike that, this has a good story and a good game to back it up. Aurally, as well, it’s a masterpiece. This is really the first game that I’ve bought since my new sound system that can output uncompressed PCM sound, and it’s done everything from shake the walls to making me think that a knock on the door from the rear speaker was real. Little things like rain, and big things like debris from explosions landing all around you just all sound crystal clear and so well defined. It manages subtlety and giving the sub a workout with equal aplomb. Don’t think it’s also just an AV upgrade, though, because Naughty Dog’s done a fabulous job of tightening up the few rough edges that the first had, gameplay-wise. Uncharted fell victim to that early PS3 problem of having to somehow justify the Sixaxis’ motion control through superfluous and gimmicky use, from the annoying but fairly sensible use of it when balancing across logs, undermined somewhat by the baffling use of motion control to aim grenades, and both are thankfully excised here. Hand-to-hand combat is less of an uphill struggle, too, as I can actually now perform combos. If I have a complaint, it’s that a lot of the environment is simply window-dressing and completely non-interactive, and as a result you can frequently find ledges and platforms that look climbable but actually aren’t. After a couple of hours, once you learn the game’s visual vocabulary, you can tell at a glance, but as it’s neither as obvious as, say, Mirror’s Edge’s red highlights – not saying that’s a bad thing, obviously – nor as organically clear as the best Prince of Persia games. It might have been a bit less subtle about the highlighting of interactive objects early on, as I’m not the only one who’s been overlooking things in the opening stages, and late on, in the mountains, there were more than a couple of moments where I fell a couple of feet to my death because that platform wasn’t meant to be jumped on. But regardless, is this an early contender for game of the year? Certainly. I’m struggling to see anything that can come close at the moment. It’s taken far too long for the PS3 to get it’s first really top exclusive game, but now that it has one (no more “PS3 has no games lol” jokes, please) it’s a very good one. The Sony camp get vindication and the rest of us got to enjoy over a year of merciless mickey-taking. It all works out in the end. 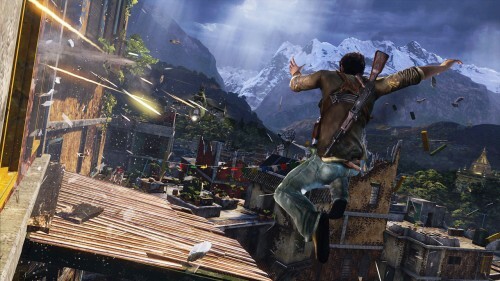 Uncharted is unlike almost most next-gen games, in that it looks beautiful and also looks colourful. It has the much-vaunted “destroyed beauty” – it’s set in the ruins of an ancient city – yet the fallen masonry is bordered by golden sunlight, lush forests, and azure tropical oceans. Even when it gets dark, superb lighting and subtle use of mist and other effects means it can do it with the same aplomb as the games that do nothing but. I hope that more games follow this lead. We need more to our games than brown and bloom lighting. And Drake is a likeable, positive character bolstered by a great script that never descends into action movie cliche. It’s an example of in-game storytelling from which others would do well to crib: characters aren’t lifted from any Steven Seagal movie, platforming and exploration is helped by sterling animation work to not rely on pixel-perfect positioning. While it lets itself down somewhat in the final acts (not quite enough to undermine the hard work that went before, it should be said) and the game isn’t brimming with content for your £50, it’s an example of how quality can outshine quantity. An eight hour romp that is never less than thrilling is worth far more to me than a twenty hour opus with fifteen hours of filler. Essential.